Is it just me or is it really easy to have superficial relationships with people? You know, you like each other or you work together or you have been friends for a long time. Maybe at one point you had a deeper relationship, maybe not. Maybe you care to, maybe you don’t. Maybe you just sort of tolerate the relationship? Since our move, we’ve had company – overnight company. I don’t know if it’s unusual but this is something that has never happened before. Besides the fact that all our bedrooms were full of children, Winnipeg isn’t exactly a tourist destination, so we visited with friends for afternoon or evening outings but rarely, if ever, spent days together. Having company, or vacationing together, really amps up the friendship factor. You get to know people on a very different level than just hanging out every few months. It has spurred me to thinking about relationships and today, I’d like to encourage you to think about some of the relationships in your life. 1. Is there one friendship that it is time to let go of? (Cue that ‘friends for a season, reason or lifetime’ meme.) Is there a friendship that doesn’t serve you well anymore, one that you have outgrown, one that takes more from you than you have to give? Maybe it’s time to give it some distance. 2. Is there a friendship that is ripe for blooming? Someone you know and like and would like to get to know better? Someone you find interesting, fun or exciting? Someone that is where you want to be? Someone that makes you smile when you think about spending time with them? Maybe it’s time to be bold and amp up the interaction. 3. 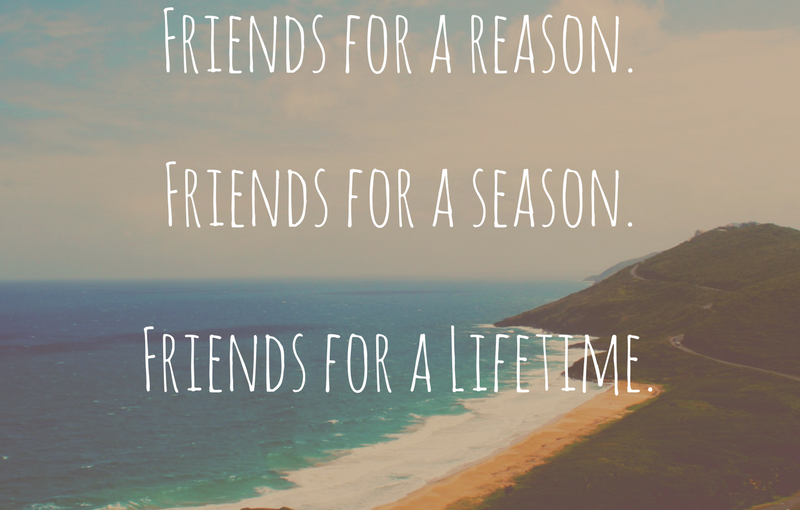 Is there a friendship that means a lot to you but the busyness of life has gotten in the way? Someone that the conversation has turned superficial? Someone that you spend your time talking about what you did since you last saw each other rather than making new memories together? Maybe it’s time to carve out space for meaningful dialogue and new memory making opportunities. Three thoughts about friendship, three points to consider. Does one resonate with you? Will you take action on one? No matter which one you choose, something wonderful is waiting for you. The status quo does not make life amazing, but quality people and great relationships in your life do! Keeping a check on the company you keep – it’s just one more way to live Your Life, Unlimited! P.S. – Thank you for being in my circle! I love that the company I keep is interested continually in bringing their “A” game to work & life! This entry was posted in Communication, Happiness, Newsletters, Personal Growth, Positivity, Relationships, Success principles and tagged e-news, happiness, personal growth, Stephanie Staples, Your Life Unlimited. Bookmark the permalink. Next Next post: Do you like your own company?